We’ve had a bumper crop of Sungold tomatoes this season. The plants go all the way up to the top of the greenhouse (at least 12 feet up) and have been producing for weeks. Last weekend, I picked two pounds of Sungolds and made them into tomato jam, a savory jam. I found originally found the recipe on Salon.com as an out of season replacement for fresh tomatoes in a BLT. My husband loves this stuff. One note about the recipe. Sungolds are super sweet by themselves so go easier on the sugar than the recipe suggests. After making the tomato jam (the small jam jars in the photo above), Derek and I moved on to canning peaches. This is the second batch of peaches we’ve canned this summer and do believe we are not done with peach canning. The pears, on the other hand, will need to be canned soon. We bought the pears last week on our way back from a short vacation to Suncadia and have been waiting for them to ripen. From the looks of it, these will need to be canned in the next few days. Canning pears is a lot of work, but they taste so good. 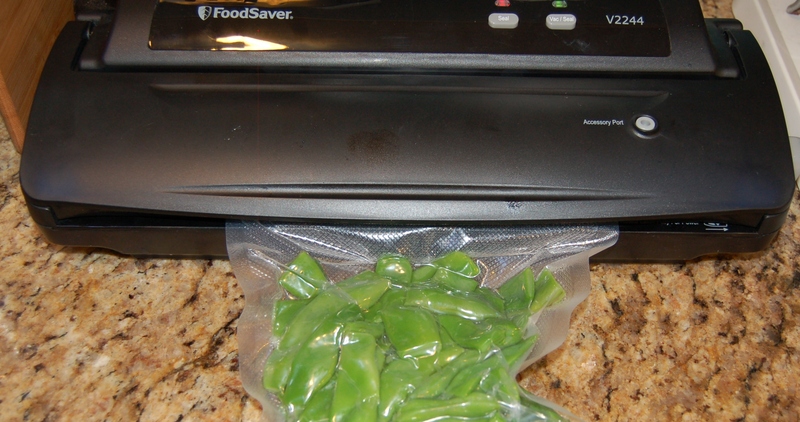 In addition to canning, I’ve been using my new FoodSaver to freeze some of our harvests. First, I processed a large batch of La Ratte fingerling potatoes. I diced and then blanched them before freezing. They will be perfect for soups or for hash browns. I’ve also started freezing green beans and I’ll have a whole bunch more to process this week. This is my first season using a FoodSaver and I love it. Finally, I’ll end with a shot of our first ripe Roma and Celebrity tomatoes. Don’t they look lovely? This entry was posted in Cooking & food preservation, Gardening and tagged FoodSaver, green beans, peaches, pears, Sungold, tomato jam, tomatoes. Bookmark the permalink. The tomato jam is a great idea. We are getting a steady supply of Sun Golds but not any volume to do much with other than fresh eating. I love canned pears. You are right they are a bit of a pain to prepare for processing, but of all the canned fruit – they are our favorite and we never fail to use them all up before the next canning season arrives.